China's Long March 2F rocket stands at Jiuquan Satellite Launch Center in northwest China. The rocket is one of the country's most successful. Image uploaded on July 25, 2013. Leroy Chiao is a former NASA astronaut and commander of the International Space Station. During his 15-year flying career, he performed six spacewalks. Chiao is the special adviser for human spaceflight to the Space Foundation, and he holds appointments at Baylor College of Medicine and Rice University. Chiao contributed this Op-Ed to SPACE.com's Expert Voices: Op-Ed and Insights. Slow and steady wins the race, the old adage goes, and China's human spaceflight program is on exactly that track. Ten years ago today (Oct. 15), China became only the third nation to launch astronauts into space. Since then, China has launched only five crewed space missions, but each one accomplished specific objectives to further the nation's capabilities. China has plans for a second crew-tended space laboratory in 2015, and will launch the core module of a Mir-class space station in 2018, with orbital construction of the station slated to be completed by 2020. China is also developing a cargo version of the Shenzhou spacecraft to support the space station. In short, China is steadily expanding its space program. Just a few years ago, a small delegation from the Astronaut Center of China (ACC) toured the NASA Johnson Space Center. The specialists, including the ACC director, were astonished by what they saw. In the Mission Control Center (MCC), they watched a space shuttle crew performing spacewalk repair work on the Hubble Space Telescope, as it was happening. Minutes later, they were in another control room, watching real-time operations aboard the International Space Station (ISS). NASA was at its best, making it all look easy. Today, things are different. The space shuttle fleet was retired more than two years ago, leaving NASA and other space agencies to rely solely on Russian assets for transportation of astronauts to and from the ISS. Today, the reality is that there is insufficient budget to accomplish even a modest exploration program beyond the ISS. Scores of key specialists are no longer at the agency or its contractors. The ISS is scheduled for operations through 2020, but there is much uncertainty on whether or not its life will be extended beyond that year. than ever before about their plans and their nearly complete launch facility on Hainan Island, with the first Long March 5 rockets anticipated to launch in early 2015. 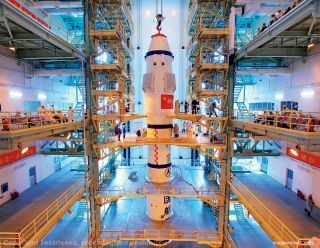 The Chinese space station first-element launch is planned for 2018, with assembly complete in 2020. China is inviting international partners to work with them on their space station. They want international research, and they want to fly international astronauts. Many of the United States' ISS partners (at least eight space agencies have talked to the Chinese about partnering and cooperation) are finding a more attractive alternative with China, or at least hedging their bets. Who can blame them? Working with China would be much less expensive than continuing with ISS. This sets up the perfect baton pass. America, already on the decline after the retirement of the space shuttle (now only Russia and China can launch astronauts into space), will on the way down hand over the leadership position of human spaceflight to the Chinese. What can Americans do to stop this? Invite China to the table. America can, and should, lead the international coalition to explore space, both in low-Earth orbit and beyond. China publicly asked to join the ISS program in 2003, only to be rebuffed by the United States. Over the years, they have made repeated calls for joining NASA and the International partners. The Russians, Europeans and even the Canadians have called for bringing China into the partnership. There are political and technical reasons that having China as a partner could be a win-win-win for all. However, certain members of the U.S. Congress are dedicated to keeping China out, dooming the United States to continue its decline in human spaceflight. The problem is, it may already be too late. China has a clear path and is moving forward. They have the perfect setup to take over the lead, enabled and propelled by the actions of the Congress. Why would they want to work with the U.S. now? The views expressed are those of the author and do not necessarily reflect the views of the publisher. Follow us @Spacedotcom, Facebook and Google+. Original article on SPACE.com.